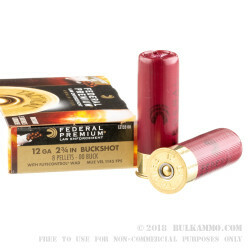 Designed for police use, Federal's Law Enforcement shotgun shells also provide effective home defense and hunting performance for the skilled shotgun user. The line's key feature, the FLITECONTROL wad, produces an unusually tight grouping for effective midrange performance. The pellets leave the barrel at a velocity of 1145 feet per second. 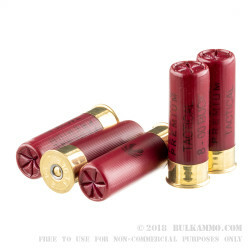 For the next 10 feet or so, the wad holds the mass of buckshot together and then gradually disintegrates to release the spread. This results in a more consistent pattern, more shot landing on the target, and reduced potential for collateral damage. 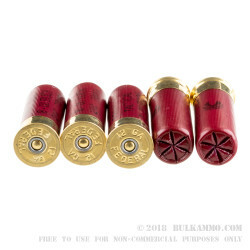 Each box contains 5 shells, which use solid brass heads instead of plated steel for reliable extraction. Each shell holds 8 copper-plated pellets. 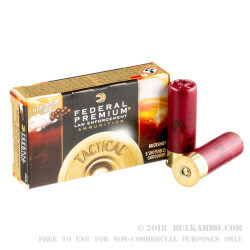 Federal Premium Ammunition of Anoka, Minnesota is one of the leading American ammo manufacturers and produces a wide variety of self-defense and range ammunition. In addition to supplying the US military as the contract operator of the Lake City ammunition plant, Federal helps law enforcement agencies and citizens protect lives and property with high quality, reliable ammunition. Use in a Kel-Tec KSG Shotgun.